After the creative peak and financial disaster that was "Sleeping Beauty," Walt Disney was going around hinting that maybe it was time to shut down the animation side altogether. It just took too many people to complete the process, and expensive films couldn't cover their own costs. One of Walt's people, though, Ub Iwerks (his oldest friend and colleague from shortly after World War I, and co-creator of Mickey Mouse), came up with an elegant solution using a newfangled process called xerography. Having his directors, Clyde Geronimi, Hamilton Luske and Wolfgang Reitherman, implement this process supposedly cut costs in half, which enabled the studio to keep grinding out a new animation feature every few years. Without it, we might not have "The Sword in the Stone" and "The Jungle Book." 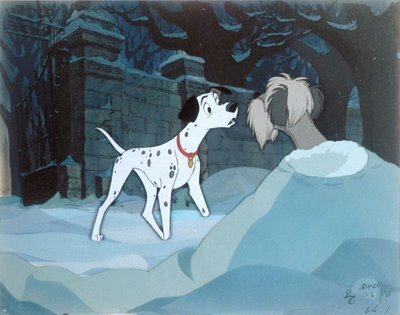 Or this classic film, "One Hundred and One Dalmatians" (1961). Walt also made a radical departure in the sorts of stories he would film. Throughout the 1950s, he completed projects that all pre-dated World War II in some way. He still had some unfinished business from that period - such as "The Little Mermaid," which wasn't finally tackled until long after his death - but the weak reception for classic fairy tale "Sleeping Beauty" induced him to look for newer, fresher ideas. That string, great as it was, had run out. He had read a 1957 book by Dodie Smith about dogs that he liked so much that he immediately ran out and bought the rights, then had Bill Peet work it up into a script. It was the first (and only) time he tackled such a recent work, so he was making a revolutionary change both with the source material and how it was made. Nobody ever accused Walt Disney of being timid. 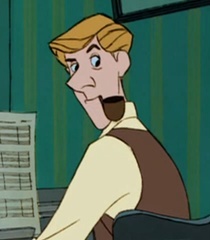 Roger Radcliffe (Ben Wright) lives in his London flat with his dalmation Pongo (Rod Taylor). 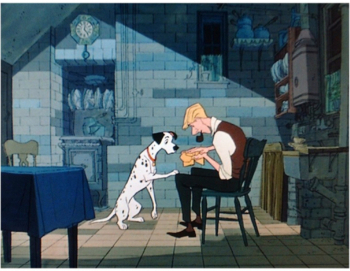 Pongo is lonely, and to cheer himself and Roger up, he thinks they should both find mates. 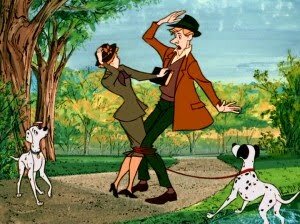 He focuses on Anita (Lisa Davis) and her pretty dalmation, Perdita (Cate Bauer). Using his sly dog ways, he arranges a meeting in the park. Both couples eventually marry. Perdita gives birth to 15 puppies. Anita's old school friend, Cruella De Vil (Betty Lou Gerson), comes to visit and decides she likes the puppies and wants to buy them. When Roger won't sell them, she hires two petty crooks (J. Pat O'Malley and Frederick Worlock) to steal them instead. 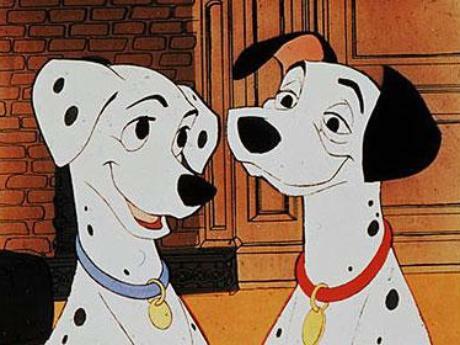 When all else fails in locating them, Pongo and Perdita resort to their fellow dogs in London for help in finding their lost brood. Sure enough, the puppies soon are located by cat Sgt. Tibs (David Franham), gray horse Captain (Thurl Ravenscroft) and sheepdog Colonel (J. Pat O'Malley). They are being kept at Cruella's old and run-down estate, "Hell Hall" (nobody ever accused Walt of being too subtle, either). 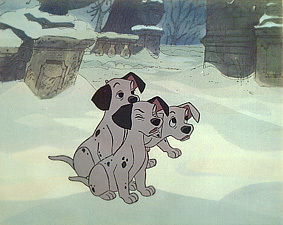 Pongo and Perdita quickly set out and, with the assistance of Sgt. Tibs and Colonel, rescue the pups. They wind up with many more former captives than just their own brood - 101 dogs in all, including themselves - because Cruella was collecting dalmations with the intention of skinning them to make a new coat for herself. Cruella and her thugs give chase, and it is a race to see whether the dogs can get back to Roger and Anita before Cruella catches up with them. 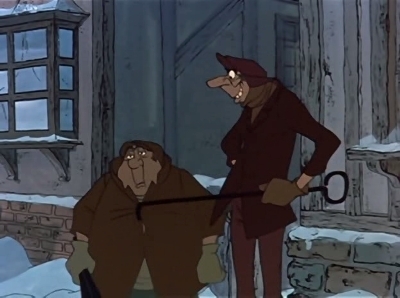 Besides the animation, which due to the new xerography process looks more cartoony (everything has black outlines) and less classically drawn than earlier Disney films, several things stand out about this film. 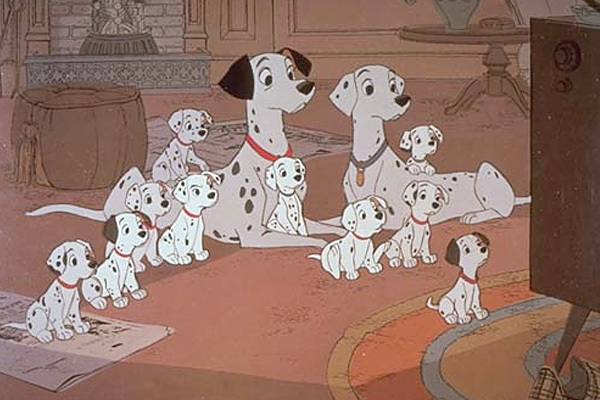 The dogs and crooks spend a lot of time watching television, which never before appeared in a Disney animated film. The sparse background score itself sounds much more as if lifted from a television show, with dramatic musical cues helping us to know how to react. The supporting animals, meanwhile, really step forward and take center stage. In the past, a Lucifer might lord it over a "Cinderella," or Siamese cats might annoy "Lady and the Tramp," but they were always bit players. Here, Sgt. Tibs masterminds a breakout, and the dogs outwit the humans at every turn. This foreshadows the further steps that Disney would take toward making the animals the central players and humans the supporting cast with "The Jungle Book" and subsequent films. At least Cruella has style! 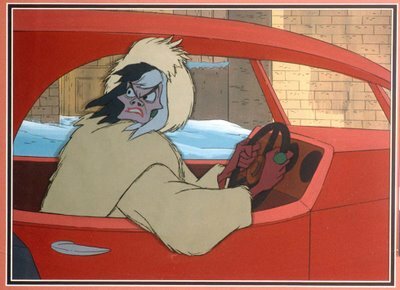 Cruella is a standard-issue Disney villainess, which means she goes to outrageous lengths to show how despicable she is before her inevitable horrible come-uppance. Focusing on dogs as the heroes works, though, and overcomes the film's other flaws. The crooks are the comic relief, not the animals, and the artwork itself is fantastic. While it looks more cartoony, there is absolutely no comparison with contemporary animated television cartoons such as "The Flintstones," whose animation looks like childish scribblings next to the elegant detail contained in each of the many, many animals drawn in crowd scenes. Some of the backgrounds, though, seem a little more perfunctory than previous Disney feature films. All quibbles aside, the film is simply fun. 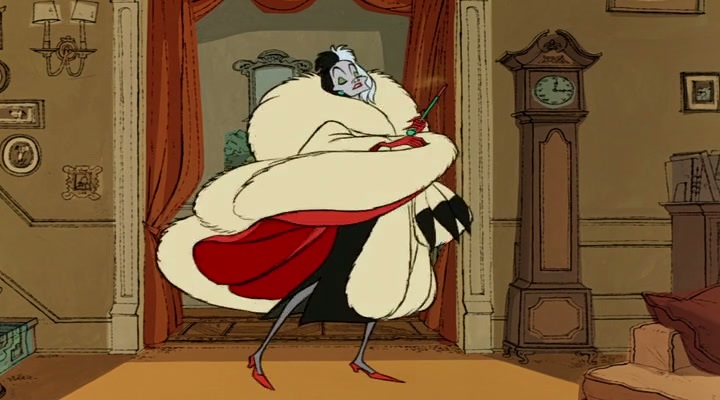 Cruella is a great villainess for whose destruction you cheerfully root, and the dogs' British upper-crust accents are a constant source of amusement. Placing the action in a modern environment offers more variety, and the two songs by Mel Levens are tuneful without going overboard with their dramatic breathlessness (which is my main complaint with songs in the "Disney Renaissance" films of the 1990s). The voice work is exceptional, managing to completely capture the characters' personalities even if you are just listening and not watching. Yes, it's a fan favorite, one of the most endearing of Disney's films. 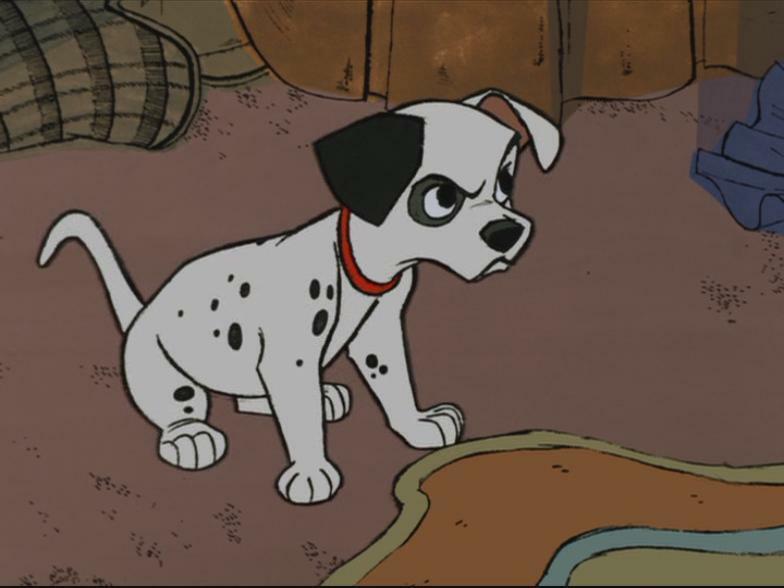 A sequel, "101 Dalmations II: Patch's London Adventure," went straight to video in 2003, while there were two live-action spin-offs, "101 Dalmations" (1996) starring Glenn Close, and its sequel "102 Dalmations" (2000). 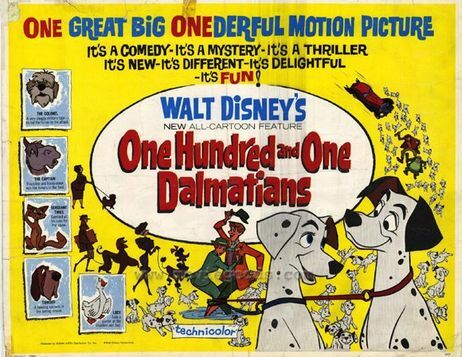 This is an easy film to recommend, not as an artistic triumph that will change your life, but as a fun way to enjoy a little time with the Disney animation family and their army of pups. Below is the Platinum Edition trailer.